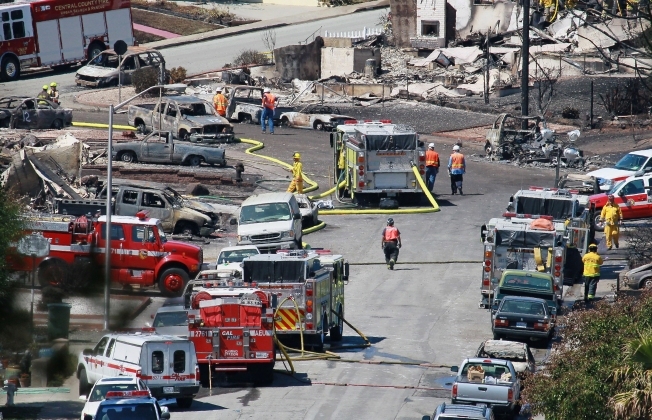 PG&E engineers boosted pressure on the San Bruno gas pipeline a year before the deadly blast despite knowing its data about the line was riddled with errors, according to testimony Wednesday in the federal criminal trial against the utility. “It was commonly known, amongst those in the organization, that it wasn’t a perfect database,” supervising engineer Todd Arnett testified about the Geographic Information System, or GIS, the company was using before the blast. Assistant U.S. Attorney Hallie Hoffman pressed Arnett whether he had concerns about database errors at the time he authorized spiking of the gas pressure in 2008. “As a general statement, yes,” Arnett replied, but stressed that he knew “how to get better data’’ if he needed to. Arnett, a supervising engineer who has spent 25 years with the company, did not seek better data before he penned the company’s official justification for the December 2008 pressure spike on San Bruno Line 132. The operation cost less than $50,000. But it was, in effect, a regulatory hedge against millions of dollars on high pressure water tests that might otherwise be imposed on the utility. To get that hedge, the company believed, the line had to run at capacity once every five years, Arnett testified, to “verify” the line’s 400 pounds per square inch maximum pressure. If it didn’t, the engineers feared, PG&E would risk having to cap pressures at lower levels to avoid the inspections caused by unexpected pressure spikes. Internal emails shown to the jury make it clear that the company viewed the spiking a top priority back in 2008. “We need to do whatever it takes to keep the maximum operating pressure of Line 132 at 400 pounds per square inch," one PG&E official said in an email sent the month the company boosted pressure for two hours in 2008. Experts have concluded that the such spikes put San Bruno line’s faulty welds at greater risk of ultimate failure. Still, the judge has ruled out any such evidence in the trial against the company. Arnett admitted that he only made a “cursory review” of the GIS database when he authorized the spiking of the line. Earlier on Wednesday, former PG&E engineer turned consultant Chris Warner testified that he believed federal officials had gone along with another operator’s rationale for avoiding inspections after pressure surges. He said he had believed that any pressure surge on an untested pipeline would trigger costly inspections. Then, he said, he saw that another pipeline operator had successfully asserted to federal regulators that it need not test lines unless pressure surged more than 10 percent above allowable levels. But then the prosecutor showed that unlike PG&E’s lines, the other operator’s line had been previously tested to vouch for its safety. Warner said he figured the other line had not been so tested. He also acknowledged that he did not check with the operator before changing his view on the ten percent margin. Before Wednesday’s testimony, Judge Thelton Henderson allowed PG&E to bring in 3,000 pages of records to potentially refute prosecutors’ allegations that the company failed to keep test records of five pipelines at issue in the case. Prosecutors urged Henderson to bar that evidence as produced too late, but he ruled it could be used as long as prosecutors had time to review it in advance.